Fighter pilot “slang” has invaded the vocabulary of everyday folk. 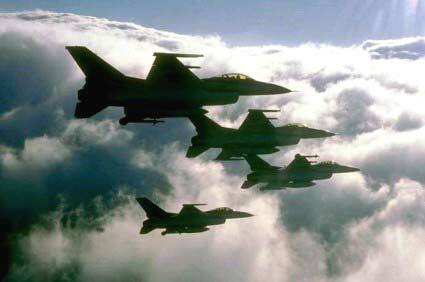 Prior to the movie Top Gun, I can’t recall ANYBODY outside of the tactical flying community using the word “ballistic.” I hear it often now. Most folk that use this term cannot define it, nor explain its origin. I guess slang is “cool” to use, but “Fighter Pilot Slang” was very serious business to those warriors that first developed it. It’s a protocol that met a wartime requirement for effective tactical command and control of a “Flight.” In combat, good R/T discipline could mean the difference between life and death. The official term is “Brevity Code”. The objective is to communicate the maximum amount of information with minimum words. The requirement for concise, timely, andunderstood information in air combat has been present ever since man first took to the air to kill his fellow human being. It all began in World War 1 with visual hand and aircraft signals (still in use today, although not as tactically important as then). Between the World Wars, air combat technology evolved to include the radio. The early radios were notoriously unreliable. This was probably the most likely reason for the development of official brevity code terminology. A second impetus was only realized after the great WWII air battles had begun… mass confusion. As soon as a fight began, everybody talked on the radio at the same time. Factor in fear, low situational awareness, inexperience, possible radio jamming, and you can easily imagine a scene of total chaos. So much for post merge mutual support! The solution, although only a partial one, was official “brief” radio terminology…Brevity Code. Brevity Code, when used properly, can be a very powerful tool in air combat. There are a few caveats, though. The first is; everybody must understand all of the terminology. Secondly, it must specifically describe an event, observation, action, or status. The radio call “Bandits,” is worthless unless accompanied by who it applies to and a relative position call. Third, it must be structured to insure that it’s understood by whom it’s intended for. Conversely, it mustn’t be misinterpreted by other flights on the same frequency. An example would be the typical “bad bandit call.” Imagine you’re escorting a flight of strikers, and out of the blue you hear “BANDITS! BREAK LEFT! !” What do you think EVERYONE on that frequency is going to do? By now I can almost hear everybody thinking…yeah, yeah, very interesting, but… how does this apply to PC flight simulations? WELL…today’s multiplayer flight simulations are rapidly reaching the realism level where effective “Comm” is an advantage. The addition of tools like BattleComm and other voice programs make effective Brevity Code desirable, if not essential. The best “Comm” scenario would be at a LAN meet where everybody can talk to each other. Imagine a 4v4 guns only furball. All the same requirements of the real thing are present, along with some additional limitations imposed by the single dimension monitor we view the fight through. Online multiplayer scenarios impose even more factors that require effective communication. “Good R/T discipline” can be a force multiplier that improves your performance, hence your satisfaction, in the modern PC flight simulation. Now that we’ve established a need… exactly how do we implement a logical solution? My answer: Mimic the protocols and structure of the US fighter force – why reinvent the wheel? The USAF considers this so important that it’s a graded item on pilot “TAC Checks” and combat readiness inspections. Later in this article there’s a summary of the “Code words,” but a few general concepts must be understood in order to ensure effective use. Sound confusing? It can be! But that is exactly why this stuff needs to be so structured and organized. Remember, our objective is to convey our exact meaning in as few words as possible. The next consideration is R/T technique. The first and most important technique is to Think before you Talk. It is much more expeditious to pause a second, think about what you are going to say…Then key the mic and talk. The most common error I see is holding the mic button while the individual is thinking. This is what it sounds like : “ahh…um..ah Numb Skull…..ah em… one two….. um…. Ah… is Bingo plus three.” A three second Descriptive R/T call just took three times as long as it should have! In a time critical environment this is UNSAT! Besides, It doesn’t even sound cool!! I even see it in the airline industry. I occasionally have a First Officer at FedEx that stumbles on the radio in this manner. I make it a point to SPECIFICALLY debrief him / her on it. Chicago O’Hare is no place to “Comm Jam” the radio with stupidity! Technique two is simple! Know your brevity code! That means the terminology and definitions! This also applies to civilian pilots. The Airman’s Information Manual (AIM) has a chapter on standard aviation terminology. 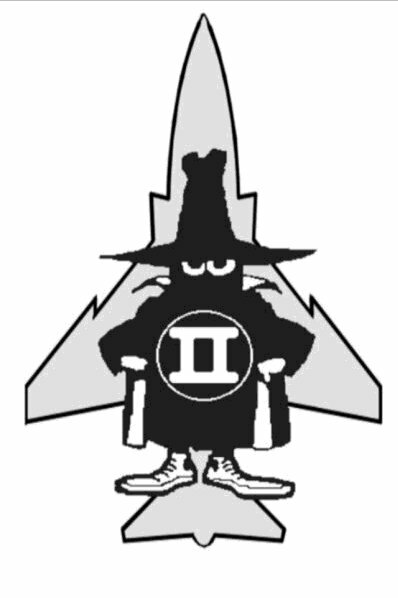 It serves the same, and in fact overlapping, function as USAF 3-1 brevity code. Ok, we now understand the basics of R/T discipline and Brevity Code. Let’s take a look at a few examples; the good, the bad, and the ugly! The word “Tally” is short for “Tally Ho!” … meaning you see “Bandits“…not an unknown “Bogie.” “Tally Ho Bandits”is redundant. Huh? What does he mean by “left two“? Well, he most likely means “left ten” and has confused his “clock” position. This is exactly the reason USAF fighter units generally preface “clock” position with a “left” or “right” prefix. Studies have determined that most folks will correctly identified relative position (Left or Right) with a much higher accuracy rate than “clock” position. Misidentification of “clock” position increases aft of the 3-9 line. If you hear a call with an incongruent relative position versus clock position, you can almost always assume “clock” position is wrong. 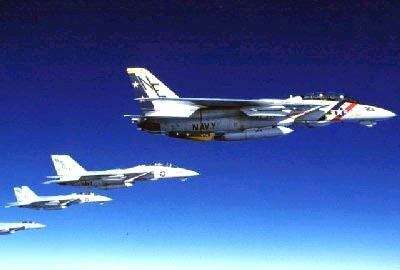 By the way, this radio call means that your wingman has two contacts identified as friendly at left 10:00, 1 mi., lower than your flight. Overall, it is actually a pretty good radio call, and most people would understand the intent and meaning. This is a textbook example demonstrating how much can be said with very few words. This simple line translates into: I have you in sight, I see the bandit, I am in a position to support you, I am supporting you, your six is clear…continue your attack. 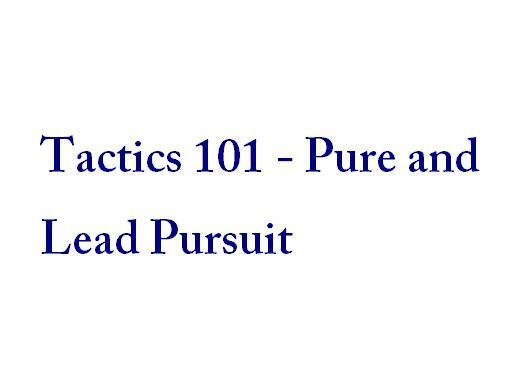 This would typically be used when the flight lead engages offensively on an unwary bandit and the wingman’s sole responsibility is to support and protect his lead. ABORT: Directive commentary to terminate. Applicable to a specific attack maneuver or entire mission. ANCHOR: 1.) Begin an orbit at a specific point or location. 2.) A refueling track flown by a tanker aircraft. ANGELS: Altitude expressed in thousands of feet. 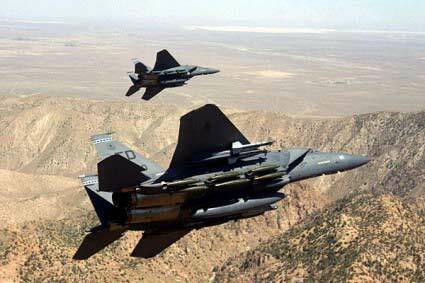 Angels 20 means 20,000 ft.
AS FRAGGED: Perform the event as briefed or planned. BANDIT: Known enemy aircraft. Only used when the contact is confirmed hostile. BEAM/BEAMER: Descriptive terminology for an aircraft that maneuvered to stabilize between 70 degrees 110 degrees aspect. Can be used to describe your own action. Example: stab 11 beaming North. BELLY CHECK: Directive commentary to instruct recipient to roll over and check for bandits underneath him. BINGO / BINGO FUEL: A predetermined fuel quantity that is required to safely return to base. BLIND: Lost visual contact with appropriate friendly aircraft. Generally means that the wingman lost sight of a flight lead. The opposite of this is VISUAL. BOGEY: An unknown radar/visual contact. BOGEY DOPE: A request for information about a specific target or threat. Generally directed toward GCI/AWACS or other flight members. BOX: Groups/contacts/formations in a square, as viewed on a radar display or from above. BRACKET: Indicates geometry where aircraft will maneuver to a position on opposing sides of a given point / target, either laterally / vertically/ or a combination of both. Basically, it is a relatively short-range pincer maneuver. BREAK: (Up/Down/Right/Left) –Directive to perform an immediate maximum performance turn. 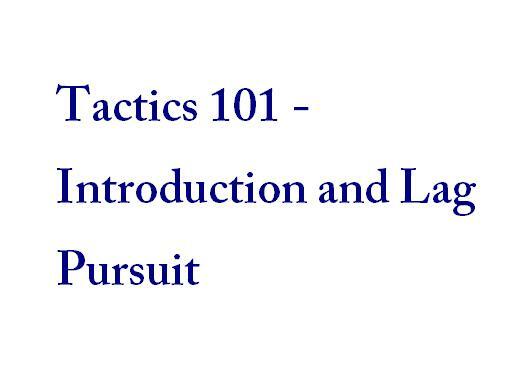 Assumes a defensive situation that requires immediate action. BREVITY: Denotes radio frequency is becoming saturated/degraded/jammed and more concise/less R/T transmissions should be used. BUDDY SPIKE: Illumination by friendly AI RWR. BUG OUT: Separate from the engagement and head for a safe area or home. BULLSEYE: A pre-briefed reference point. It is used to describe your position or that of the target. CLEAN: 1.) No radar contacts, i.e. your radar scope is clean. 2.) An aircraft configuration without any external stores or tanks. CLEARED: Requested action is approved. CLEARED HOT: Ordnance release is approved. CLOSING: Bandit/bogey/target is decreasing its range. COLD: 1.) Attack geometry that will result in a position behind the target. (lag pursuit) 2.) Pointed away from the anticipated threats. CONTACT: Radar/IR contact; should include bearing, range, altitude (BRA), Bull’s-eye, or geographic position information. CONTINUE: Continue present maneuver; does not imply clearance to engage or to shoot. COVER: Directive R/T to assume supporting role and responsibilities. DEFENSIVE: (Spike/Missile/SAM/Mud/AAA) – Subject is in a defensive position and maneuvering with reference to the threat. If not explicitly stated, threat is assumed to an air/air threat. 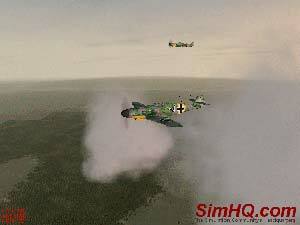 DRAG/DRAGGING: (Direction) – Bogey/Bandit maneuvering to 60 degrees or less aspect. Can also describe your own actions. ENGAGED: Maneuvering with respect to a threat or target in order to kill or negate an attack. EXTEND: (Direction) – Directive to temporally depart the immediate “fight” location gain energy, distance, time, situational awareness, or a combination of all. The intent is to reengage as soon as desired parameter is achieved. FADED: Radar contact is lost or has “faded” from your radar display. FLEET WET/DRY: Transitioning from flying over water/land. FENCE CHECK/FENCE IN/FENCE OUT: Set cockpit switches as appropriate to your location. Generally means to arm up weapons as you enter enemy territory and safe them as you proceed back to friendly airspace. FLANK/FLANKING: Target with a stable aspect of 120 degrees to 150 degrees. FLOAT: Expand the formation laterally within visual limits. Used to initiate a “bracket” or to force a commit from a trailing bandit. FOX ONE: Simulated/actual launch of semi-active radar guided missile. An AIM 7 Sparrow. FOX TWO: Simulated/actual launch of an IR guided missile. An AIM 9. FOX THREE: Simulated/actual launch of a fully active missile. AN AMRAAM/Phoenix. GADGET: Radar or sensor equipment. GIMBALL: (Direction) – Radar target of interest is approaching azimuth or elevation limits of your radar and you are about to loose contact. GORILLA: A large number of unknown contacts that appear to maneuver to a common objective. GROUP: Radar Contacts that appear to operate together within approximately 3 Nm of each other. HARD LEFT/RIGHT: Directive call to initiate a High-G, energy sustaining turn. Generally used when entering a fight offensively. A ‘break’ turn is used for a defensive situation. HIGH: Target altitude at or above 30,000 feet MSL. HIT: A Radar return on the Radar scope (A/A). HOLDING HANDS: Aircraft together in a coordinated visual formation. HOT: 1.) For an AI intercept ‘hot’ describes geometry will result in roll out in front of target 2.) Pointing toward the anticipated threats in a CAP (A/A). 3.) Weapons employment authorized. IN PLACE: (Left/Right) – Simultaneously maneuvering the whole flight in the specified direction. JOKER: Has had several definitions 1.) Fuel state is such that the mission can continue to the target via scheduled route and RTB, but with little or no reserve. 2.) Fuel state is such that the entire mission can be flown and all the ordnance carried all the way back to home plate. Generally used when the target is obscured by WX and Higher Headquarter directives preclude jettisoning bombs prior to RTB. KILL: Commit and kill specified target. LINE ABREAST: A side-by-side formation. LOCKED: (BRA/Direction) – Radar Lock on. DOES NOT ASSUME SORT OR TARGETNING responsibilities are met unless specifically stated. MEDIUM: Target altitude between 10,000 and 30,00 feet MSL. MERGE/ MERGED: 1.) Bandits and friendlies are in the visual arena. 2.) Radar returns have come together. NO JOY: Lost or no visual contact with the target/bandit; opposite of TALLY. NOTCH: (Direction) – Radar missile defensive maneuver to place threat radar/missile near the beam. PADLOCKED: Aircrew cannot take eyes off target without risk of losing tally/visual. PAINT: Friendly AAI/APX interrogation return. PICTURE: Situation briefing given by AWACS or GCI that provides a general tactical overview. POSIT: Request for a position report. PRESS: Continue the attack; mutual support will be maintained. SEPARATE: Leaving a specific engagement. SHACKLE: A weave or a single crossing of flight paths in order to regain formation geometry. SLOW: speed of less than 300 knots. SNAP: (object, destination, location.) – An immediate vector to the requested target or geographic point. SORTED: Pre-briefed criteria has been met insuring each flight member have separate targets. SPIKE: RWR indication of AI threat. SPITTER: (Direction) – An Aircraft that has departed from the engagement. STACK: Two or more groups with a high/low altitude separation. 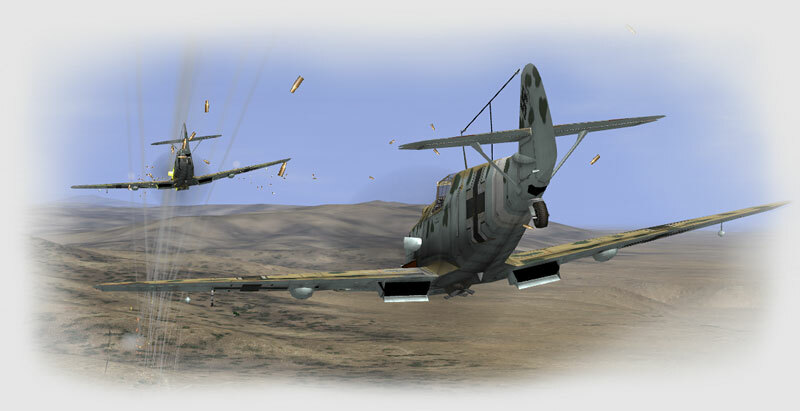 STINGER: Formation with single Bogey/Bandit in trail. SWITCH/SWITCHED: Indicates an attacker is changing from one aircraft to another. TRAIL: Formation of two or more aircraft following one another. TRAILER: The last aircraft in a formation. TRASHED: Missile in flight has been defeated. TUMBLEWEED: Indicates limited situation awareness, no tally, no visual, a request for information. VEE/VIC: Vic formation, single aircraft in the lead and an element in trail. WALL: Three or more groups in line abreast/side-by-side formation. WEDGE: Tactical formation of two or more aircraft with the single in front and two line abreast behind: Same as a “Vee” formation.